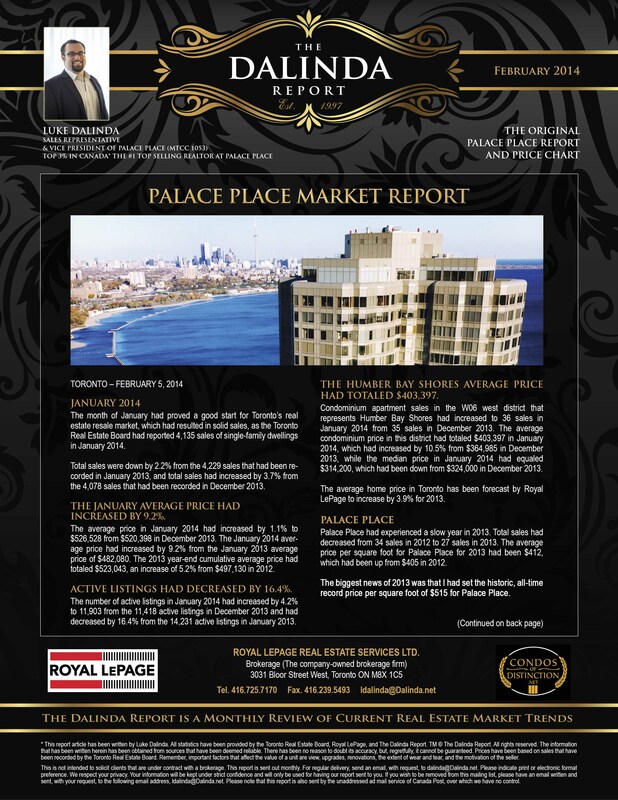 The Dalinda Palace Place Report, February 2014, is out! The new issue of The Dalinda Report has just been posted! Palace Place had experienced a slow year in 2013. Total sales had decreased from 34 sales in 2012 to 27 sales in 2013. The average price per square foot for Palace Place for 2013 had been $412, which had been up from $405 in 2012. The biggest news of 2013 was that I had set the historic, all-time record price per square of $515 for Palace Place. I am honored to have again sold the most Palace Place suites and to have yet again set the most record prices for Palace Place by far. My biggest complaint of 2013 is that Palace Place owners are not doing their homework and far to often have accepted lower market valuations from realtors looking to make a quick sale. When these new shoebox condos are selling for $700 to $1000 per square foot, you can see that there is a lot of room for improvement in our $412 per square foot average. In 2013, there had been 476 sales of condominium units that had been priced under $450,000 in the Humber Bay Shores area. In 2013, there had only been 117 sales of condominium units that had been priced above the $450,000 price point. Of that amount, there had only been 38 sales of condominium units that had been priced between $500,000 and $600,000. Of those, only 4 sales were from Palace Place. Finally, since January 2013, there had only been 37 sales of condominium units that had been priced above $700,000. The big difference between 2012 and 2013 is that 2013 had seen the release of over 57 suites from Nautilus, 16 Brookers Lane, a brand-new Monarch building. To date, 48 of those suites have sold and 9 suites remain on the market. Traditionally, Palace Place has stood on its own with the introduction of new condo buildings into the marketplace. While Nautilus is definitely not Palace Place, it is a very modern, brand new condo that offers great views and balconies. Palace Place has experienced a challenge in competing with this “new factor”. Add the challenges of qualifying for a mortgage under the new rules, and it is clear how we have seen a decrease in sales. 2014 will see even more new inventory come on the market, and a lot more is scheduled for 2015. It will take hard work and passion to keep the incredible value proposition of Palace Place at the forefront. I continue to seek innovative solutions to attract buyers to your suite. I truly believe that Palace Place is the best-built building in Toronto and one of the city’s foremost residential opportunities. This report article has been written by Luke Dalinda. All statistics have been provided by the Toronto Real Estate Board, Royal LePage, and The Dalinda Report. TM © The Dalinda Report. All rights reserved. The information that has been written herein has been obtained from sources that have been deemed reliable. There has been no reason to doubt its accuracy, but, regretfully, it cannot be guaranteed.